Day to night is a pretty simple concept in the summer. A bit of extra eyeliner, swap out your flats for heels, a little jewelry change and you're good to go. Saturday turned out to be the perfect set up for a day-to-night blog post. Saturday afternoon, we went to lunch downtown and then wandered around the Farmer's Market and played tourist in our own city and rode the trolley. 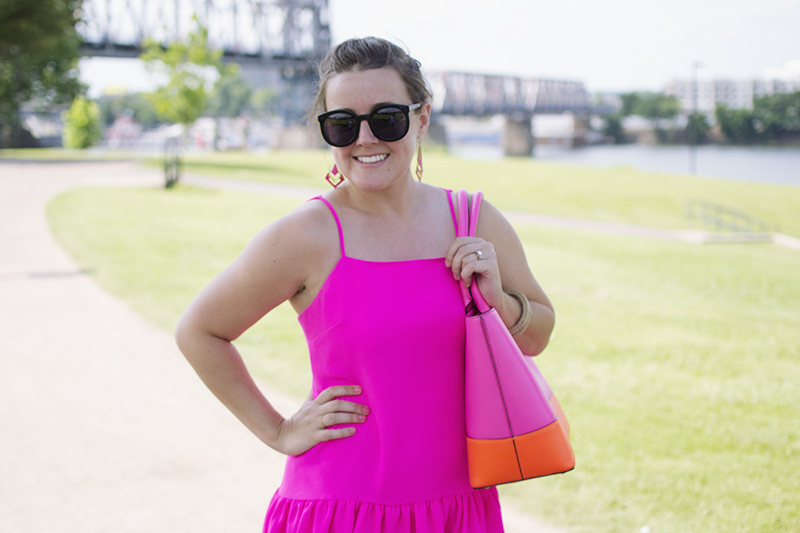 Flat sandals, a big tote for carrying some peaches from the market, and large sunglasses made this dress perfect for day. After our Little Rock afternoon, we headed to Conway for dinner with friends and it was a simple switch to get ready for evening. Heels, funky necklace, clutch - and I went ahead and put my hair up for a little extra oomph. I have so many thoughts I've been compiling about my second go at 30x30. In my first attempt, it was summer and while I learned a lot, I also swore I'd never do another one. Then I lost my brains and decided it would be so much easier the second time around. 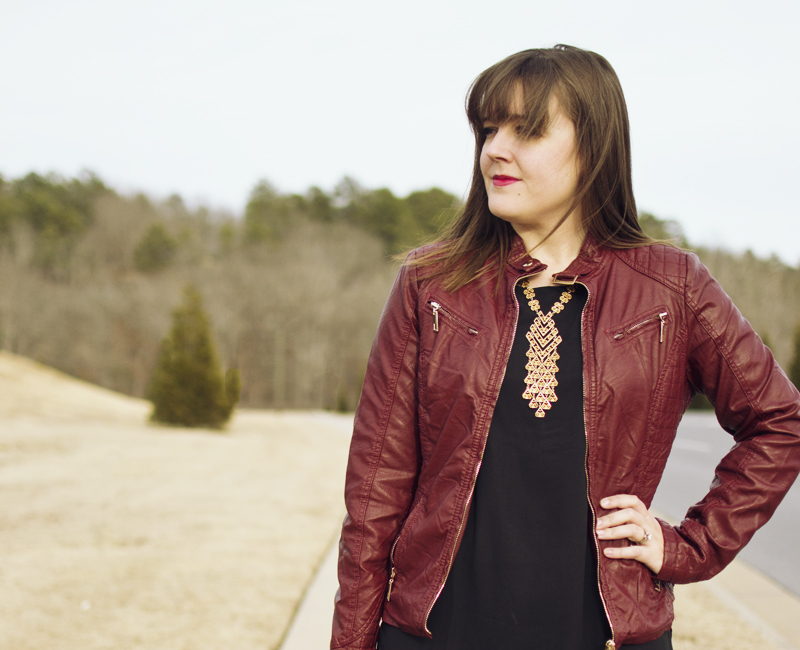 While I was right in a lot of ways, I also came to a few realizations about my wardrobe. This month's 30x30 was essentially my experiment with the "uniform" concept - I created a small capsule wardrobe where almost everything could be worn with everything. The colors were fairly muted and safe, and I stuck with similar silhouettes overall. So what happened, ultimately, is that I STILL got bored. Why is that? I had a difficult time coming up with new outfits last time I did the 30x30, while this time I felt my pieces offered me plenty of variations. But I boxed myself into some boring looks by not providing enough variety to my 30 pieces. Two grey sweaters seemed like a safe option at the time, but toward the end of my journey I was wishing for something in pink or green or anything else. 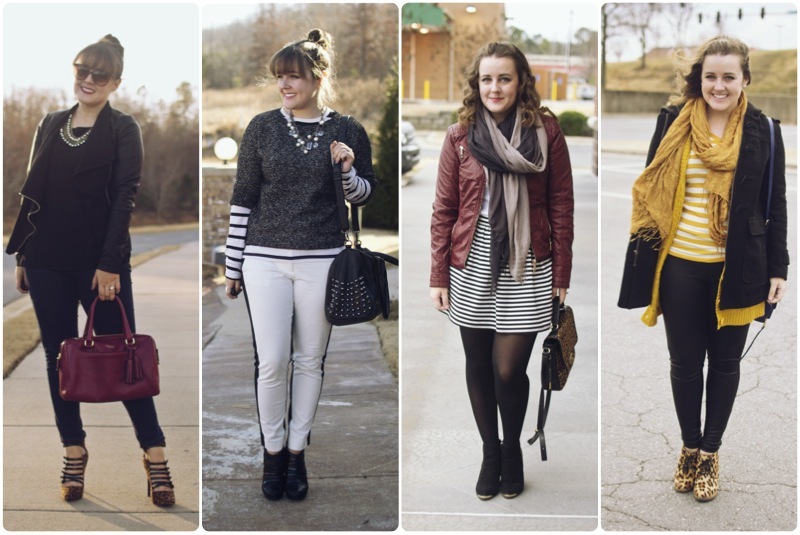 There was SO much black and white, which I generally love as a base...but most of my favorite all-time outfits are black and white with a little color. So here's a recap of the 30 outfits I made with only 30 pieces this month. So what did I learn? After wishfully thinking the uniform concept might be the answer to an over-stuffed wardrobe and discontentment with my clothes, I've discovered that it's not for me. I crave far too much variety in my wardrobe to stick to a seasonal capsule wardrobe. I DO however subscribe to the theory that certain shapes and colors just work for a person, and I'm going to explore that theory further. While I might not be converting my wardrobe into a minimalist uniform any time soon, I'm going to concentrate on the pieces that I love the most and think about the why. I love skirts with a fitted waist and a flared bottom. I love anything with leather on it. I like straight ankle pants and stripes. I love a-line dresses, peplums, and flowy silk tops. I'm a big jacket person! By recognizing these small consistencies I have in my dressing process, I can continue to buy items that I love and want to wear every day - therefore, creating a wardrobe full of "Can't Wait to Wear" (instead of nothing to wear). I also kept track of the numbers during this experiment to see which pieces were my most-worn - and which could have been left out of the mix. My white sleeveless blouse topped the list at FIVE wears total. Y'all already knew it was a favorite, as I pack it on almost every trip I go on, winter or summer. The more I can analyze pieces like that one and figure out why they're a favorite (fit? fabric? brand? remixability? ), the more I can apply those theories to future purchases. I'm still on a journey to define my style and figure out the "formula" for dressing (the math/science portion of my brain believes it truly exists! ), so I plan on sharing my NEXT step in the exploration with you in the next couple of days. I'm about ready for another closet purge and I have a pretty defined goal for 2014 with my shopping budget on what I want to do with my closet. This 30x30 remix made me realize that I do play favorites in my wardrobe - I crave variety in dressing - but I also love a certain consistency in general. Armed with this information, I can continue to build and refine my wardrobe. HERE WE ARE...LOOKS LIKE WE MADE IT...These are my final two outfits of my 30 for 30 remix challenge! Tomorrow I'll wrap up the challenge with a big ole bow so you can see all 30 outfits in one place (along with my musings and learnings from the process). Today, we celebrate the last two outfits of the remix. They're hardly inspired; in fact, I could have made about 20 more interesting outfits, but they represent something I'd forgotten - boots make everything cuter. Even if you're wearing just a poncho and a bra, slap some boots on and you'll look like a true fashionista. Don't tell the cop that arrests you for indecent exposure that I was the one who told you that. Outfit 29 :: This mustard striped shirt added some variety for my love of stripes - and yet, it only appeared one other time in the remix. I gave it a little love today with this sweater that, as it turns out, really only looks good one way. Sweater, SheInside. Tee, Target. 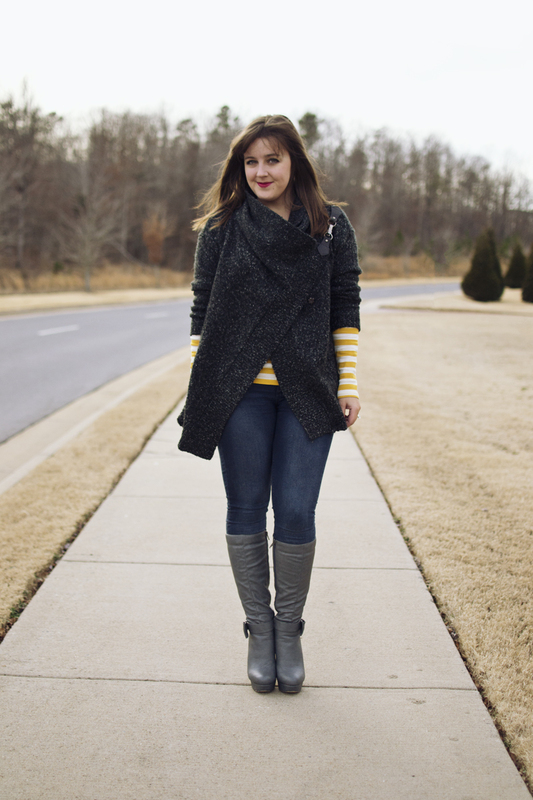 Jeans & Boots, JustFab. Outfit 30 :: I'd originally worn something more party appropriate for the 30th outfit, but this is taking it back to where we started. Leather and black. This leather jacket was also supposed to provide variety. It also got worn only one other time. The theme of today's outfits is, "I'm trying to wear some stuff I didn't in the remix". Jacket, Forever 21 (similar). Top, LOFT. Leggings, Express (that's leather shine, not my leg color you see there). Boots, ShoeDazzle, I think? Even though this challenge can be frustrating, boring, and even...challenging at times, I still love it. It's a great way to dig into your closet and get to know what works a lot of different ways and what doesn't. I've become a more conscious shopper because of this challenge; I used to buy things because they were SHOWSTOPPERS for one time wear only and then never wear them again. Now, I'm more careful to look for things that I know I can wear over and over in many different ways. 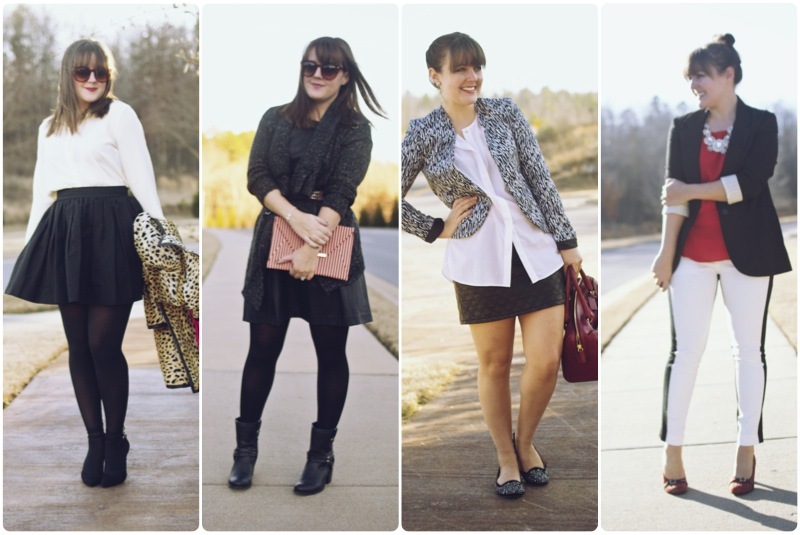 I highly recommend challenging yourself to remix your own closet once in a while! Especially in small chunks...and perhaps not killing a whole month.